PM says at jubilee celebration of liberation of Judea and Samaria that Jews returned to their ancestral homeland, and none will be expelled. The ceremony marking the 50th anniversary of the liberation of Judea, Samaria, eastern Jerusalem, The Jordan Valley and the Golan Heights took place in Gush Etzion Wednesday evening. 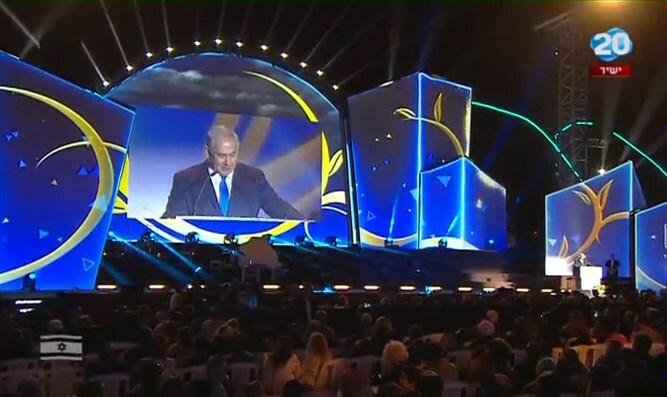 The event was attended by Prime Minister Binyamin Netanyahu, Cabinet ministers, Knesset members, council heads, rabbis, and other public figures. Prime Minister Netanyahu said: "On this day, on this occasion, I think of the defenders of Kfar Etzion who fell here in 1949. I think 'if they could remove the dust from their eyes. If only they could see us today. If only they could see what has been accomplished in the last 50 years." "You can understand my friends that I and my wife Sarah are very excited to be with you," Netanyahu continued. "We thank you for your warm welcome. Like you, we are aware of the historical significance of our being here, because the history of this place is the essence of our people's heritage. We are all children of Kfar Etzion." Netanyahu added that "in the miraculous defensive war, 50 years ago, we returned to Gush Etzion, to the Old City of Jerusalem, Judea, Samaria, the Jordan Valley and the Golan Heights. Which meant that we had returned home to our ancestral inheritance, and that we had renewed the historical continuity of our people. Here lies the story of our nation and our history, as well as the promise that that history will never be cut off." The prime minister said that 50 years ago he was a soldier in Gush Etzion, and that during a visit to the area, "I looked around. Right here the convoys traveled to Jerusalem. Right here is where King David was born, was anointed king, and fought with Goliath. Here Bar Kokhba fought the Romans. In the generations of the return [to Judea and Samaria] the settlers of Gush Etzion turned bare mountains into blossoming orchards." "Seven decades ago, a few facing many, surrounded by a hostile choking ring. Waves and waves assaulted them. The convoys that came to their aid, in particular the 'Convoy of 35,' [were massacred]. But the courageous pioneers held out until the bitter end. They themselves gave the answer - to win the battle for Jerusalem. Netanyahu promised in his speech, "There will be no more uprooting of homes in the Land of Israel. It's not just a question of context. We will not uproot - neither the Jews nor the Arabs. Any territory that falls into the hands of radical Islam becomes a base for murder, violence, death. Instead, we will strengthen the communities and their momentum." "Only a few weeks ago we inaugurated the southern interchange at Begin HIghway in Jerusalem, a road that connects directly to the [Gush Etzion] tunnel road, and the road from Gush Etzion to Jerusalem is significantly shortened because of this. Tonight I say - the Etzion Bloc will always be part of the State of Israel," declared the prime minister.